Shaun and Kate Carter by the sediment pond they fenced off, cleaned out and expanded. 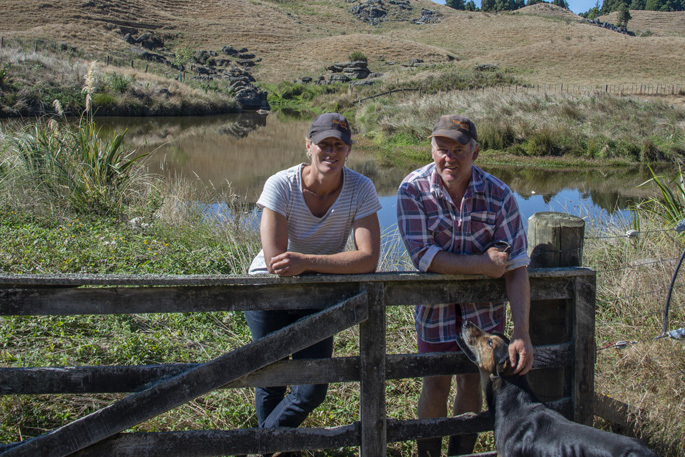 Third generation hill country farmer Shaun Carter and his veterinarian wife, Kate, are the custodians of land that’s been in Shaun’s family since 1942. The couple run their Pio Pio farms with two staff, Nigel Keightley and Jack Griffin. Shaun’s parents, John and Judy Carter, are also part of the partnership with John still actively involved. In addition to the 503ha home farm, the partnership has a 300ha block, and a 140ha lease block close by. While there are effectively two farms run on the land, the operations are one business, with staff pulling together as a big team to achieve the larger tasks, eliminating the need for extra hands during busy times. Two gravel pits on the farm ensure all races can be well maintained, allowing year-round access to most areas. Stock movement can be controlled using quad bikes and members of the 12-strong team of dogs. The farm runs around 4700 Romney Coopworth sheep, and around 920 cattle of mixed age and gender, focusing on rearing bulls and lamb for meat. Kate has her own veterinarian business, but takes responsibility for the health of all stock on the farm, has her own farm responsibilities, and is also a busy mum to the couple’s three sons. Lachie, 9, Leo, 8, and Mac, 7, absolutely love farm life, wholeheartedly helping out on the farm at every opportunity. The mainly rolling land with some flat and some steep areas, is stunning, with 360 degree views from the higher points. However, the limestone karst scenery, with its rocky outcrops, tomo and underground cave systems, is a challenging environment to farm. Shaun acknowledges the work that his father started 25-30 years ago demonstrated an empathy to the environmental factors that faced him. John’s forward thinking also led to stands of pine trees being planted around some of the non-grazeable areas, and waterways, and the last of these are now being harvested. While Shaun’s choice will be to return these areas to native bush, he appreciates how the project has been a valuable financial asset to the farm so many years on. The farm falls under the Mangaotaki sub-catchment area. Shaun and Kate plant 600-1000 plants a year and these include riparian areas, and areas with the highest run-off and nutrient loss readings. “Making focused natural wetland areas slows water movement, reducing soil particle movement, and phosphate leaching into the waterways,” says Kate. They are constantly reviewing areas that may need retiring or protecting. Their Farm Environment Plan contains goals the farm is committed to meeting. “We’re aiming to fence all our waterways in the cattle areas by 2020,” says Shaun. Utilising natural spring water on the property, and three electric pumps, most paddocks have troughs. “Our Grazing Management Plan ensures we avoid having cattle where creeks are unfenced, and these areas are sheep only blocks,” says Kate. Their soil types are identified in the FEP, and the information is helpful for deciding where to crop. Mainly chicory and plantain are grown for finishing lambs. The Maeroa ash soil is forgiving in winter and light in summer. Shaun is focused on managing erosion issues on the property, especially where the cattle are concerned. “Technically, under our business plan, we could raise 1000 bulls on the land, but if we did that the damage would be irreparable. The choice to run less of the stock line that gains weight the fastest does cost the farm financially, but they enjoy rearing their own calves, and having different lines of stock. “Older cattle are a good pasture management tool. They carry a much lower worm burden to pass onto the younger stock, and they eat the older grass,” says Kate. The ongoing environmental measures put in place earned the partnership the Beef+Lamb NZ Livestock Farm Award and CB Norwood Distributors Ltd Agri-Business Management Award at 2017’s Waikato Ballance Farm Environment Awards. The partnership was also winners of 2018’s Western North Island region Silver Ferns Farms ‘Plate to Pasture’ award, proving quality production and environmental awareness go hand-in-hand. The partnership seeks to continue with John’s approach, in unison with current environmental laws and requirements. “We aim to integrate animal health, with the health of the environment,” says Kate. “It’s an ongoing balance between high production and respecting the environment,” says Shaun.